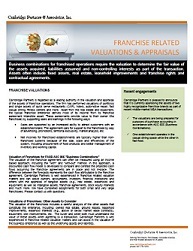 Business combinations for franchised operations require the valuation to determine the fair value of the assets acquired, liabilities assumed and non-controlling interests as part of the transaction. Assets often include fixed assets, real estate, leasehold improvements and franchise rights and contractual agreements. • Sales are supported by an increased ability to attract customers with an established brand. The agreement calls for support to the franchisee by way of advertising, promotions, territorial exclusivity, market analysis, etc. • Net incomes for franchised establishments are typically higher than non-franchised systems because of the size, scale and efficiencies of the system, including procurement of food products and better management of inventory and working capital. 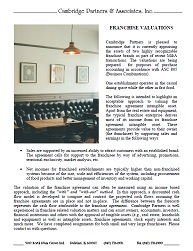 Valuation of Franchises for FASB ASC 805 "Business Combinations"
The valuation of the franchise agreement can often be measured using an income based approach, including the "with" and "with-out" method. In this approach, a discounted cash flow model is developed to compare and contrast the projected cash flows assuming the franchise agreements are in place and not in-place. The difference between the forecasts represents the cash flow attributable to the franchise agreement. Cambridge Partners is well experienced in franchise related valuation matters and can assist owners, accountants, investors, financial institutions and others with the appraisal of tangible assets (e.g., real estate, leaseholds and equipment) as well as intangible assets, franchise agreements, stock equity interests and much more. We have completed assignments for both small and very large franchisees. Please contact us with questions. The valuation of the franchises includes a careful analysis of the other assets that constitute the enterprise, including: owned real estate, ground leases, leasehold improvements, leasehold interests (e.g., above or below market lease contracts), equipment, site improvements, etc. The buyer and seller both must understand the value of these assets when agreeing to a transaction. Cambridge Partners is well experienced in franchise related valuation matters and can assist in the valuation of the business enterprise as well as the underlying assets and liabilities. The valuations are being prepared for purposes of purchase accounting in accordance with ASC 805 (Business Combinations). One establishment operates in the casual dining space while the other in fast food.